It's safe to say that Jeff Gordon is one of the greatest NASCAR drivers of all-time. He's also one of the most popular. 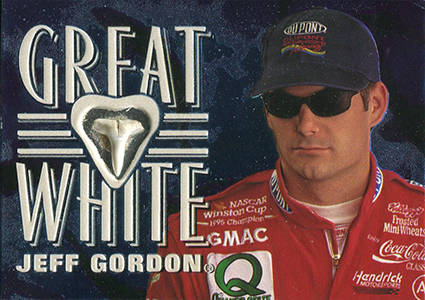 Gordon was one of racing's biggest stars when NASCAR's popularity rose sharply in the mid- to late-1990s. That popularity carried over to the hobby as well with Jeff Gordon cards getting a lot more attention than most of his peers. Shop for Jeff Gordon cards on eBay. Early cards date back to his teenage years. His first cards appeared prior to his NASCAR debut as part of sets for the World of Outlaws Sprint Car Series. 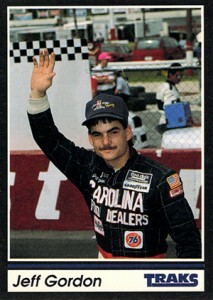 Jeff Gordon's debut on NASCAR cards came not long after in 1991. Since then, collectors have had tons of options to collect number 24. From base cards and rare inserts to autographs and memorabilia cards, there's something for every type of collector. 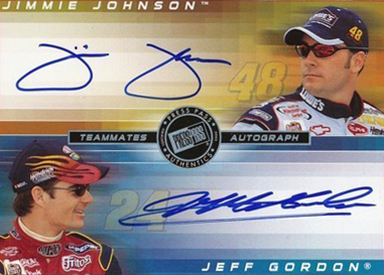 With thousands of Jeff Gordon cards to choose from, here's a small sampling of great cards released over the years. While they're important in their own right, this is not a definitive list of the most valuable cards. Many we've highlighted are actually very affordable. The hobby has evolved a lot since Gordon started his racing career. 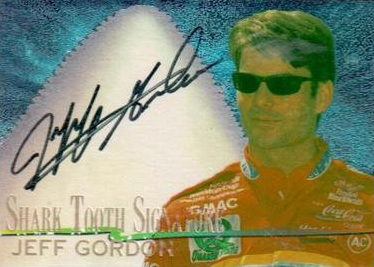 Today, many of the most valuable Jeff Gordon cards are ultra-rare inserts and parallels that come with combinations of signatures and unique memorabilia. 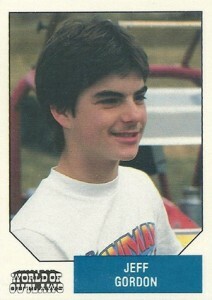 The first Jeff Gordon card came in the 1987 World of Outlaws factory set. Given its niche release, it's not the easiest card to come across. However, they are out there. Besides being his earliest card, it's also notable for how young the would-be racing legend is. The 1991 Traks Jeff Gordon is his card available in packs. It's also his first mainstream NASCAR card. Because of this, many consider it to be the Jeff Gordon rookie card even though it's not the first. Supply is plentiful so prices are very reasonable. 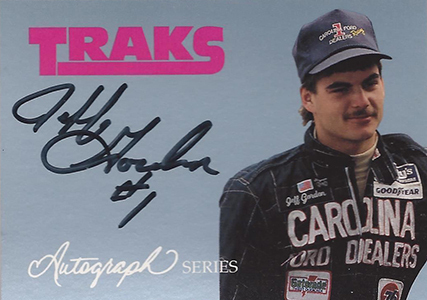 The 1992 Traks Autograph Series Jeff Gordon is one of his first certified signature cards. It's also one of his most affordable due to the fact that there are a quite a few of them. Quantities can be measured in the thousands, which is a far cry from the limited print runs in modern sets. 1997 Wheels Race Sharks has no shortage of strange cards. Among them is a Jeff Gordon card that isn't your typical relic. Instead, there's an actual shark's tooth embedded in it. Why? Does it matter when it's this weird? 1997 Race Sharks isn't all about cards with teeth. For those who like etched foil, there's plenty of that as well including a Jeff Gordon autograph. Although it's numbered to 400, supply has largely dried up meaning it may take some patience to track one down. Upper Deck made some interesting cards in the few years they held a NASCAR license. Among them are the Driver's Seat inserts from 1997 Upper Deck Victory Circle. The cards use a cel design to show the driver as if you're looking in the window. Inserted 1:69 packs, they're moderately tough to find today. Multi-memorabilia cards are a lot more common today than they were in the late-1990s. 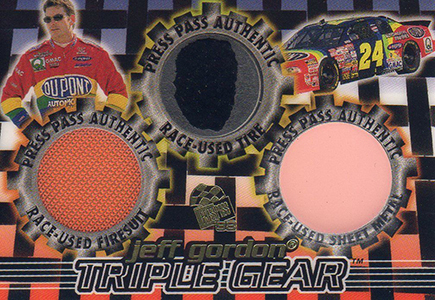 The 1998 Press Pass Triple Gear 3-in-1 Jeff Gordon not only has three swatches, but they're all different types of material. You've got your race suit as well as a race-used tire piece and a slice of sheet metal from Gordon's car. The set has other Triple Gear cards that are more common but they don't have three relics. What do you get when you combine signatures from two of the era's greatest racers? One heck of an autograph card. 2004 Press Pass Eclipse has another dual autograph with Gordon and Johnson that's also numbered to 25. Four Wide became one of the more popular Press Pass inserts. As the name suggests, they come with four pieces of memorabilia. 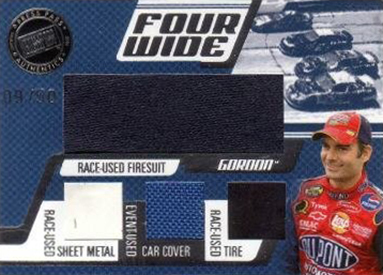 Jeff Gordon's first Four Wide caard has sheet metal, a piece of a car cover, a tire swatch and an over-sized piece of race-used firesuit. The Gordon and Johnson dual autographs are fantastic in their own right. An extension of Eclipse's Teammates series comes this quad autograph that adds Dale Earnhardt Jr. and Casey Mears to the mix. 1999 Upper Deck RTTC ROAD TO THE CUP GOLD LEVEL 3 #RTTC1 Jeff Gordon BV$30! what about the 20 0f 20 autograhed jeff gordon card in 1993 Max…..
what about 1996 racers choice , busch clash card with his birthday as 7/4/71… misprint?? 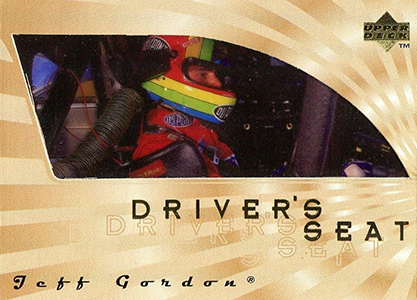 1997 Upper Deck Jeff Gordon Million Dollar Memoirs auto card Rare!!!! !